Turkish Politics in Action: Into the Bunkers? The EMASYA protocol is one of the most typical examples for perceiving the protocol and its legislations superior to the law, for applications contrary to the law and for one of the privileged devices of the military tutelage system. The interior security doctrine restructured after 28 February was build upon the EMASYA Protocol. The Protocol consists of 27 articles regarding the Provincial Administration Law (no. 5332) article 11/D and was worked out by the General Staff Presidency and the Ministry of the Interior on 7 July 1997. In cases deemed necessary, the protocol directs the intervention of military forces in situations of incidents regarding internal public order and security. In accordance with the EMASYA Protocol, internal security operations and regional police task forces, village guards, gendarmerie internal security units and gendarmerie units conjoin with the highest ranking Land Forces Command (KKK) unit in the region upon the consent and approval of the governor. Police special operation task forces are subordinate to EMASYA Region and Subsector Commands; provisional village guards report to the regional Gendarmerie Command which again is subordinate to the EMASYA Command. Therefore, in terms of territorial issues the gendarmerie is not connected to the Ministry of the Interior but to the military authorities in such situations. The "Public Order and Security Centres" established in each province garrison are made dependent on the military in terms of organizing the provincial police and civil chiefs of intelligence, assessment and planning. Due to this structure, the entire information gathered by civilian units and the intelligence can be obtained by the military. Again, the military can intervene in civilian incidents without permission of the civilian superior in situations deemed necessary. Thus, interior security is in fact provided by the military since provincial civilian structures are outranked by the armed forces. According to the Protocol, internal security operations and the regional operation command are subordinate to the highest ranking military unit of the region. This unit is connected to the KKK in a large part of the country. In the south-eastern provinces of the country the operational status is not temporary but permanent, which means that public order is under control of the military in wide parts of the country. One of the means to expand the Gendarmerie's jurisdiction is to deprive the governors of their duty in individual incidents or issues pending for more than one year which would normally be covered by the police forces. The previously mentioned article 10(c) of the Law on Gendarmerie Operation, Duties and Authority has been issued according to article 11/D of the Provincial Administration Law which is shaped by the EMASYA Protocol. At the same time, joint operations by the gendarmerie and police forces upon the permission of the civil superior and the directive of the prosecutor become increasingly common. This situation is highly compatible with the internal security doctrine of the military authorities and is indirectly relevant to the EMASYA Protocol. “As you know, EMASYA originated from public order, civilian and military cooperation. As a matter of fact, article 11 of law no. 5442 of the Special Provincial Administration clarifies the issue. Actually, if it was consummately read, that much discussion would not take place,” Başbuğ said. “Yet, what is important here to us is the rule of law. It is out of the question even for the EMASYA protocol to go over the law, and it should not be inconsistent with the law, as well. Law no. 5442 is very clear: “The governor is superior to all general and local law enforcement officers.” This is irrevocable under any circumstances. Everything is under the command of the governor,” he said. Basbug also commented on Article 9 of EMASYA, which gave the Turkish Armed Forces (TSK) permission to intervene in "social incidents." According to Basbug, this is not the TSK's job, stating that a strong distinction be made between terrorism and the former, the meaning of which is still unclear, but from Basbug's words, seem to pertain to mass meetings, such as protests and marches. Prime Minister Erdogan was the first to announce plans for the annulment of EMASYA, and President Gul followed up soon after with a statement urging the government and military to repeal the controversial protocol, which the European Commission has long listed as an impediment to Turkey's accession to the European Union (see the latest progress report). The EMASYA annulment follows revelations about the alleged Balyoz coup plans, which the TSK maintains were merely war games scenarios. With EMASYA gone, questions have arisen as to whether the National Security Document (MGSB) may face similar annulment or overhaul. The MSGB is also known as the "Red Book," and critics have long characterized it as a kind of secret constitution, another secret document facilitating government intervention in internal security matters. The Human Rights Association (IHD) and the Human Rights Foundation of Turkey (TIHV) are challenging the MSGB; their lawyer, Ozturk Turkdogan, is currently arguing the case before the Council of State. However, so far the government has refused to respond to questions from the Council of State about the contents of the MSGB, responding that the document is a "state secret." Turkdogan claims the MSGB is unconstitutional since the document was never submitted to parliament, to which the constitution stipulates the cabinet answer in regard to national security matters. In addition to the government drafted MSGB, there are also significant concerns about the broad powers the current constitution enumerates to the Armed Forces. Though reforms in 2004 reduced the powers of the National Security Council to advisory and increased the number of civilians who sit on the Council, reformers claim the constitution still leaves broad room for the military to maneuver. The Feb. 28 process is still fresh in the minds of many of these reformers, and further reform of the constitution in this area is also critical to the accession process. He told Hürriyet that he wished the GATA incident had not happened. Could his harsh remarks to Habertürk have come because of his ‘wish’? He may have delivered those harsh remarks to calm ‘covert groups’ within the military and avoid their criticism [?] 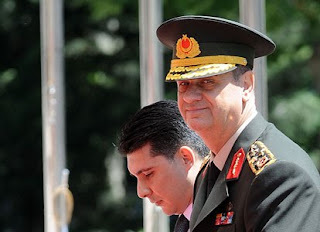 . . . .
To me, Gen. Başbuğ can’t wait for August to remove the ‘ordeal’ of his uniform. Just like [former chiefs of general staff] generals Hilmi Özkök and Yaşar Büyükanıt did. UPDATE I (2/20) -- The Natioanl Security Council (MGK) met on Friday, Feb. 20, and are assumed to have discussed amending the National Secuirty Document (MGSB). Some observers think the MGK might remove contests pertaining to Islamist threats. The other two main threats the MGSB identifies are extreme leftism and ethnic separatism.